A 101 on how not to get ripped off for housing in Montreal. It is illegal in Quebec to request a damage deposit or advance rental payments. The landlord can, however, request payment for the first month’s rent when the lease is signed. Chances are if your landlord asks for a security deposit of any kind, they’re trying to take advantage of you as an out-of-town student. If the landlord refuses to rent to you because of your refusal to pay a deposit, walk away and report them to the Régie. Pay It Forward—When You Vacate Your Own Apartment, Transfer Your Lease. Transferring your lease (also known as “assigning your lease”) to the next tenant, rather than back to the landlord, makes it more difficult for the landlord to raise the rent illegally, because the new tenant has documentation about the old rent. By law, the landlord cannot stop you transferring or subletting your apartment unless the landlord can provide serious, verifiable objections to the new tenant. The best way to transfer a lease is to send the Régie du logement lease transfer form to your landlord by registered post—if they do not respond within 15 days, the lease is considered transferred. What Do All These 2.5 and 4.5 Numbers Mean?? 1.5 = 1 room + bathroom (a rather ascetic choice—probably not the best idea for most students). 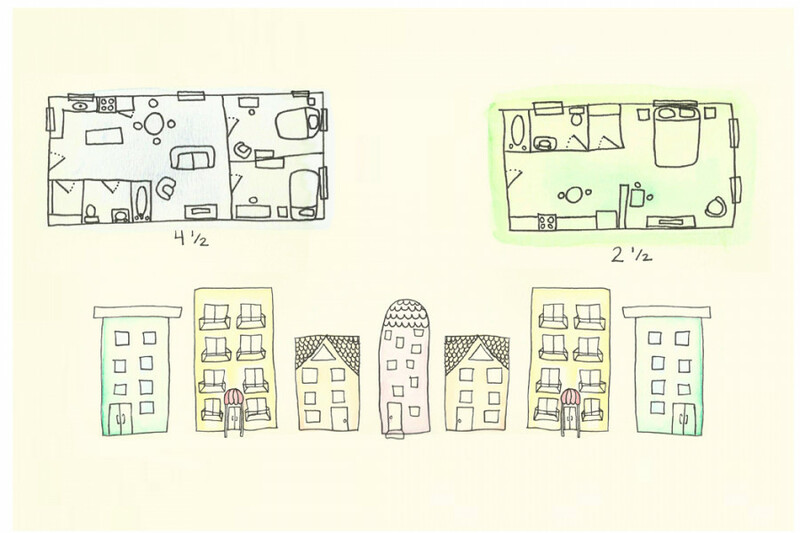 2.5 = “2” rooms + bathroom (usually way smaller than it sounds, with a kitchen island posing as the second “room”). 3.5 = bedroom + kitchen (usually not closed) + living room + bathroom. 4.5 = 1 to 2 bedrooms + kitchen + living room + bathroom (the trick here is that 4 refers to the number of rooms, but they’re not necessarily closed – it could be a “double” living room or bedroom where one of the walls turns out to be a curtain). 5.5 = usually a 2 bedroom + kitchen + living room + tiny office (or a double living room instead of an office) + bathroom (it could be three full bedrooms, but that’s rare—usually that’s a 6.5 and up). And so on (anything over 8.5 would be very unusual, and 7.5/8.5 are rare as it is, but they do show up once in a while). Heating can be expensive in Montreal. If you can, take down the address of an apartment you’re interested in, and call Hydro-Québec 514 385-7252 (they’re the provincial utilities company) to find out the average monthly heating cost (they’re open 8 a.m. to 6 p.m., Monday to Friday). If heating is included in your rent, remember that your landlord is required to keep your apartment properly heated—technically, it should be no lower than 21º C in winter. Contact the Régie if you have problems. You don’t want to pay month-to-month unless your roommates have a 12-month lease. Otherwise, you won’t have much guarantee of your rent amount otherwise, and it gives you the strongest rights as a tenant with the Régie du logement. Plus, if you’d like to qualify for Quebec tuition later on, you’ll need to prove residency using your lease. “Sublet” means it’s a temporary (usually only 1 to 3 months)—these ads get mixed up a lot with long-term rentals and lease transfers. If you’re looking for a longer-term rental, always confirm that the apartment is not a sublet and that you will have a full lease for the period that you need. Twelve months is strongly recommended because it gives you the most rights with the Régie and you can always sublet or transfer for the summer, if need be. A lease transfer is usually a very good thing: it means the current lease is directly transferred to the new tenant. Do not agree to a substantial rent increase if you sign a lease transfer agreement—if it’s over $20 more a month than before, you’re almost definitely being ripped off. If for some reason you discover that the previous tenant paid substantially less, you can file a request with the Régie. If they find the increase to be illegal, your rent will be retroactively adjusted to the lawful amount. If you have a 12-month lease, you may get a form from your landlord around four months before your lease is up, notifying you of a rent increase. A lot of these forms, particularly from big apartment buildings or landlords catering to out-of-province students, pretend the choice is only between accepting the increase or moving out. This is not true. You have a third option: to refuse the increase and stay in the apartment, regardless of whether or not this option is listed on the landlord’s form. Feel free to print out your own form and send it back to the landlord, ticking this third option. Contact your landlord to request justification for the increase, and check with the Régie if necessary. In Quebec, unless you give notice in time (usually 3 months before the end of your 12-month lease), your lease will automatically renew for another year, unless you receive a notice of rent increase. If you do receive a rent increase notice, you’ll be granted an additional 30 days to decide whether to move out. If you need to leave your apartment before the end of a lease, you must formally transfer the lease to a new tenant—otherwise, you are legally responsible for the rent payments remaining on your original lease. The specific deadlines are also written on the back of your lease. Bedbugs are a growing problem in Montreal, and you should be super careful. Bring a flashlight to inspect any cracks, interview outgoing tenants, and if the apartment is furnished, inspect the mattress seams for eggs or tiny bloodstains. You need to ask the landlord directly if there have been any problems with bedbugs or other vermin in the apartment building. Do this before you sign the lease. If you’ve been deceived in any way and/or the landlord fails to take care of any problems that arise, you need to contact the Régie right away to find out what recourse you have to financial compensation, including the cost of moving to a new apartment. Almost every neighborhood has one, and many are affiliated with Front d’action populaire en réaménagement urbain (FRAPRU), the wonderfully militant Quebec housing rights group responsible for many of the renters’ protections available to tenants today. Neighbourhood groups vary in quality and activity level, but it’s always a good idea to check yours out and get involved. If you intend to live in Quebec long-term and want to apply for Quebec residency for tuition purposes, you will need to prove how long you’ve lived in Quebec. The best thing to do is to make sure that your name appears on your lease, which also provides you with more tenant protections. If this is not possible, make sure your name is added as soon as possible to the apartment’s monthly hydro bills. You can also ask your landlord to sign a letter attesting that you have been living there, but of course they might refuse. To learn more about how to prove Quebec residency for tuition purposes, check out Concordia’s guidelines.